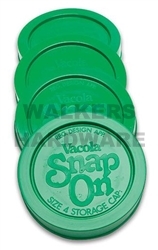 Snap-on Caps have been designed for easy, airtight storage after bottled preserves have been opened but not consumed in their entirety. Snap On Caps transform preserving bottles into storage jars ‘in a snap’, so that Fowlers bottles can be used all year ‘round. They are moisture-proof and airtight and will guard against insect infestation.